First, during Eid-ul-Adha we remember the spirit of Prophet Abraham (peace be upon him) and how he was willing to sacrifice the person he loved the most, because it was Allah's command which he had to obey no matter what! Second, Eid-ul-Adha ends the period of Hajj (the 5th pillar of Islam ). Every year, about 3 million people go to Mecca and perform the pilgrimage together. To be actually so near the Kabah is to be closest to Allah. Its a entirely out of the world experience!! Celebrating Eid-ul-Adha with your family and friends is similar to that of Eid-ul-Fitr. Each 'Eid is a Thanksgiving Day where the Muslims assemble in a brotherly and joyful atmosphere to offer their gratitude to Allah for helping them to fulfil their spiritual obligations prior to the 'Eid. This form of thanksgiving is not confined to spiritual devotion and verbal expressions. It goes far beyond that to manifest itself in the shape of social and humanitarian spirit. This Islamic form of thanksgiving is a wholesome and rare combination of spiritual devotion and humanitarian benevolence. Each 'Eid is a Day of remembrance. 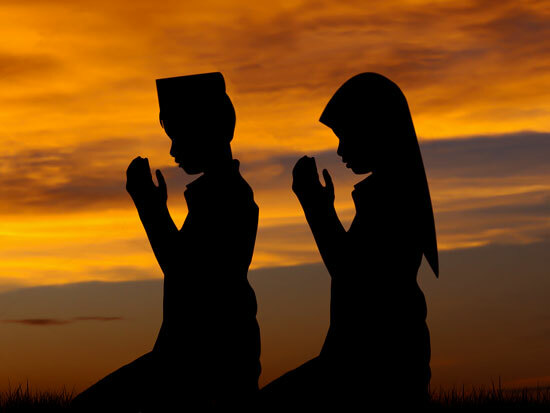 The Muslims pray to Allah and glorify His name in an act of remembrance of His favors. Along with that ,they remember the deceased by praying for their souls, the needy by extending a helping hand, the grieved by sympathizing with them, the sick by cheerful visits and utterances of good wishes, the absentees by cordial greetings and sincere consideratenes. Thus the meaning of remembrance on the Day transcends all constraints and expands over far-reaching dimensions of human life.